As with many scientific and medical breakthroughs, the discovery of the link between gum and cardiovascular diseases started off rather unexpectedly. Back in 1989, a group in Finland wanted to find out if heart disease could be linked to other chronic diseases. They did the usual blood analysis to detect heart problems and also conducted other medical examinations not unlike what a family doctor might do. 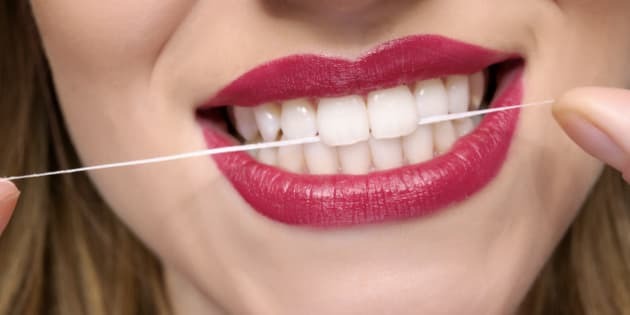 They expected something but never imagined they would find a link between the inevitably fatal problems with a rather common condition many of us have: gum disease. young woman teeth with dental floss. The study sent the public health community into a firestorm of debate. The study was praised by some, panned by others. But over the following years, the link between unhealthy gums and the risk of a heart attack solidified. By 2006, there was little doubt the link was real. Yet that was only the beginning of the story. Although a quick inspection of the gums could offer clues as to what might be happening inside the arteries, there was no known mechanism. The primary culprit was of course, germs although no one could properly explain how that happened. The premise was simple enough; bleeding gums would permit bacteria to enter the bloodstream and cause inflammation known to initiate disease. But how exactly this occurred was a mystery. The first clues came a few years earlier, in 2003, when a group of bacteria were designated as suspects. They included hard-to-pronounce names including Actinobacillus actinomycetemcomitans, Bacteroides forsythus, and Porphyromonas gingivalis. Though no experimental work had been done, these three were known to cause inflammation at a low level without causing bloodstream infections. The hope then was to focus on one or more of these microbes to elucidate the mechanisms and offer medical professionals the ability to develop procedures for diagnosis and treatment. The search took a few more years but by 2010, the scientific community had their germ: P. gingivalis. Based on studies in the lab, the introduction of this bacterium into vascular tissue led to inflammation and the initiation of atherosclerosis. Even more important was a preliminary understanding of the mechanism. Much like any other infection, the bacteria triggered the immune response though contact with the body's cellular sentries leading to inflammation. Where this infection differed was the way it led to a persistent infection without clinical symptoms. To answer how this was possible, researchers investigated at the cellular level. Using a variety of models, they were able to understand how infection progresses. Though the discoveries were good news, the overall message was anything but. P. gingivalis had the ability to evade the immune system by surviving and thriving inside immune cells, masking the signals to confuse the sentries, and sending out a molecular weapon appropriately named gingipain to destroy many of the immune system's messenger molecules. In essence, the low level inflammation was not due to a poor bodily response, but an efficient debilitation by the bacterium. With the localized battle appearing to be almost impossible to fight, researchers went about trying to identify how infection began, in the hopes of finding a means to prevent its establishment in the blood and treat it after it happens. This week, a team of American researchers unveiled the initiation mechanism leading to infection. The discovery also opened the door to potential paths for future preventative measures. The team examined one particular molecule known as lipid A which has properties of both fats and sugars. They developed strains of P. gingivalis with altered functions leading to different forms of the suspect and then introduced the bacteria into mice. The group found the mutated forms were able to evade the immune response allowing infection to progress. Without these changes, the bacterium was not able to efficiently begin infection and ultimately could not predispose the mouse to other chronic problems. The team also identified a key host molecule in this process as an immune messenger known as interleukin 1β (IL-1 β). The molecule is involved in the initiation of inflammation and is known to play a role in the development of atherosclerosis. When P. gingivalis caused infection, the functional lipid A kept IL-1 β levels low. Yet, if the lipid A was not working properly, the IL-1 β levels were high and infection was prevented. Though the mechanism was simple, the authors admitted finding solutions would be significantly harder. Controlling the function of an immune molecule has proven problematic particularly as other side effects could occur leaving a person even more vulnerable to other health problems. As a result of this study, the potential for therapies is limited and preventative medical options are essentially impossible. The only answer it seems is to follow regular oral health and avoid gum disease as much as possible. For those who eschew the toothbrush and the dental floss, this could be a wakeup call. For those who do follow regular oral hygiene, you can add prevention of heart disease as yet another benefit to taking those few minutes to keep those pearly whites shining.